"Over the past six months I was given the opportunity to take the SKYLOTEC Rescue Pro 2.0 for a test drive, and feel more than confident in my ability to give an honest and accurate review. To start, the shoulder pads have a wider stance, allowing the straps to lie on my shoulders rather than my neck, which is an issue I’ve had with other harnesses. The folded webbing was extremely comfortable around my neck; even after a long, hot day there were no discomfort issues. The waistband was highly padded, allowing me to move with great ease and comfort. The thick padding and larger surface area of the leg loops made time spent hanging without a podium pleasant; adjustments were easily achieved while hanging. The gear loops were strategically and thoughtfully located, and the sheer quantity of them was beyond appreciated. While the D loops often rotated in the webbing at inconvenient times, it wasn’t a major issue, nor did it distract me from my work. The main gear storage was rigid, making it far easier to clip in lockers even when contorted. Gear storage on the leg loops provided quick access to lockers, and I found I could easily install a carry tool on the waistband webbing. The rescue knife was small and compact, making it so I forgot it as there at times. I never had to use it when I was on-line, but I did play with it a little and found it worked quite well, though I was concerned that under a well-placed blow, sustained contact from a confined space, or something of that nature it might break. The chest ascender performed well staying in place with the keeper cord and the washer prevented all contact with the material. I did find that the cam was difficult to open more often than not, mostly when I was not fully weighting the rope or in an awkward position. The first row of teeth on the cam often snagged; when I encountered these opening issues, it caused some sheath damage to the cow tails. There were a few instances when the connection ring beneath the chest ascender rotated sideways. I believe that this issue was due to the harness being new, as it only occurred a few times after the harness was worn-in. Overall, I did not encounter any pinch points that I have had from other harnesses, even in normally uncomfortable positions. Another great perk was that the harness did not ride up like other harnesses I have used, and I think it has held up exceptionally well to everything I’ve thrown its way. 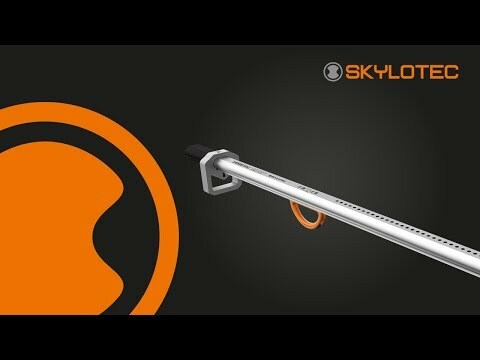 I’ve performed a multitude of varying projects, and the SKYLOTEC Rescue Pro 2.0 has fit the bill for every one of them. As of yet, this has been the most comfortable and practical harness I’ve experienced."